Whew! Christmas was a whirlwind this year! It's always a little tricky with how many different sides of the family we have to cover in a short amount of time, and this year was no exception. We had three solid days of back to back holiday events. It's a lot of driving, a lot of coordination, and a lot of fun. And now that the egg nog has worn off and we are coming down from our present induced high, I might not get out of my pjs for a week! Just before the chaos began, I decided to take my little family on a surprise trip. Most of December the closest we came in terms of a holiday outing was checking out the finely decorated trees in the lobbies of various healthcare establishments. Right before Christmas it seemed that everyone's antibiotics, inhalers, and varieties of cough/cold medicines had kicked in enough that we could trade in our tours of North Georgia urgent cares for something a little more festive. On a whim, I heard about some of the holiday events being offered at Reynolds Plantation, and in a rare moment of spontaneity, I booked a room for Christmas Eve Eve. Our little family had a tough year, and on top of everyone being sick, I knew the holidays would be a little tough to get through. Even if only for 24 hours, getting away seemed just what the doctor Saint Nick might have ordered. Friday I packed our bags, grabbed Mr. Cute from his office in Atlanta, and made our way Southeast to our lovely holiday destination - the Ritz Carlton at Reynolds Plantation. Now Carrie Beth has been several times over the last few years, but even though Mr. Cute and I have had a few opportunities to stay we've always had something come up. 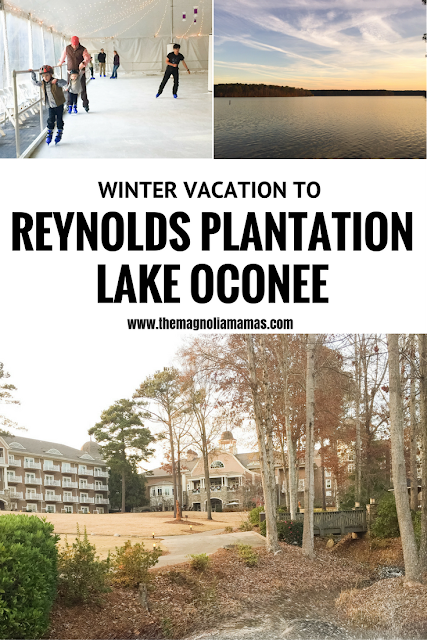 I had heard from several friends though that it was an awesome local resort for families, and when I heard about some of the holiday and winter festivities on site I knew it would be a hit with my crew. The resort has a decadent lodge style feel to it, and the rustic holiday decor greeted you from the moment you stepped onto the property. With it's big cozy couches and large warm fireplaces it was holiday magic in it's own right. I was there five minutes and knew it was going to be tough to leave. Pretty enough to eat right? The lobby had this amazing larger than life gingerbread house that both kids and adults were in awe over. I couldn't believe how large it was, or the fact that it was 100% an actual gingerbread house. Can you even imagine how much time went into creating this? And check out all those ingredients! I loved that they had a little candy bar set up just outside the gingerbread house. The Cutes made sure to taste test as often as possible whatever treats were left out each time we passed by. Our room was on the top floor overlooking the grounds, and I was a little nervous upon booking if it would be large enough. I went back and forth about getting a suite for a family our size, but came to the conclusion that the kids would end up in bed with us at some point so I just went with a double queen room. It was plenty large enough and fit a crib nicely as well. I loved that we would get to be cozy together - especially considering the fun surprise that I had planned later in the evening for everyone. We had a good laugh at the mini bar too. They must have known Mr. Cute was coming because it contained all his favorites, and the wine bottle coincidentally was named his first name. Once we got settled in the room we made our way down the festive hallways to the fun ice skating rink set up on site. The Cutes were beyond excited about this. Cute has become fascinated with all things snow and winter related and has religiously asked to go for months now. As for L.C., well you can thank the lovely people of Arendale for her excitement. It had been a good 20 years since Mr. Cute or I had put on ice skates, and he was a good sport about being the one to keep up with The Cutes first. In the end though we weren't needed. The kids picked it up pretty quickly and after about half an hour both were skating without holding onto the wall at all. I was pretty impressed - especially with L.C. who just turned three! After an hour the kids still wanted to skate, but the adult part of the party needed a break from their skates. It was so much fun, and I knew we would make another lap or two around the rink before we left so it was easy to break away from to see other things. We decided to take a walk on the grounds and check out the lake. On our way to the lake we stumbled upon this fun playground and basketball court. It was such a fun afternoon of play, and I think I was reassured that I made the right choice for a last minute family trip. I loved how kid friendly and relaxed everything turned out to be. The lake is one of our happy places, and we couldn't help but feel relaxed as we were able to catch the sunset just before dinner sitting in these fun adirondack chairs. We learned later that you can rent actually rent this lakeside space to have dinner by these cute little chimneas. We logged that for later because it was such a gorgeous view! Once everyone's stomach began grumbling we made our way to Gaby by the Lake for dinner. Their entry sign cracked us up! But it was just another nod to the casual laid back elegance that the resort had presented to us so far. We loved the lake views and the southern style fair. I would have taken more photos to share if the kids candy high hadn't kicked in from earlier, and L.C. decided she absolutely loved visiting the bathrooms at Gaby's - apparently the hand washing was superb. After dinner, we made our way back to our room to get ready for s'mores by the campfire that the Ritz offers each night. I'm so glad we crossed the lobby at this time because we were able to see the gingerbread house all lit up. And we were able to hear the carolers. There were several other families with kids (and dogs) staying, and it was so fun for The Cutes to sing and dance to some of their favorites with new friends. Now here's where our plan went slightly askew. I thought s'mores were scheduled for 6:00p.m., but my tired eyes didn't notice it was really 8:00p.m. We couldn't wait up that long because I had a fun surprise scheduled for that time. So we changed our plans and headed to the game room that specially set up for the holidays. Trust me, none of the kids (young or old) complained. Just as we were snuggling into bed we heard a little knock on the door. To be honest this was one of the reasons I booked the trip. I heard you could schedule an elf tuck in for the kids. The kids were beyond excited and L.C. could not stop jumping up and down on the bed clapping her hands and telling them she loved them. The elf tuck-in is by reservation only and you have to pay a small fee, but it includes milk and cookies for each child, a book with a special message from Santa to keep (extras available), bed time stories, and tuck-in service. We chose to give each of the kids a copy of The Night Before Christmas. The concierge called me several times to confirm the spelling and ages of the kids, check on any food allergies, and make sure everything was just right for them. It was so easy! Most definitely something I hope they cherish and remember through the years. The next morning, after a bed shuffling night of sleep (see one room was the way to go), we made our way to a yummy buffet breakfast at the onsite Georgia's Bistro. Again, no photos, but trust us it is worth trying. Yum! We had some down time before we had to hit the road back home, so we made our way back to the rink. It opened at 10a.m. and for a little while the kids had it all to themselves. They skated for about an hour, and the moment their skates came off they asked when we could skate again, and Cute asked if he could do hockey. If they weren't snow obsessed before I think they are now. We couldn't leave without saying goodbye one last time to the candy station gingerbread house, and while we munched we played some games. There is a huge game room off the concierge desk that guests are able to get any game, puzzle, and coloring book you can imagine. When asked it was one of The Cutes' favorite things about the resort. I loved that they had such a fun time, and I was so glad that we were able to get this fun break together before the holiday chaos. But listen we will totally be back. Now knowing it's only two hours away from Atlanta and SUPER kid and dog friendly, it makes for such an easy trip. And if none of that is enticing enough, the complimentary hot chocolate or hot apple cider is worth returning for alone.